Luca came home the other day, asking questions about war and why Dad had bought a paper poppy that he was wearing on his jumper. I explained, as best I could, about what war meant... what soldiers do... and that in some countries, war was still happening. Luca seemed fascinated by the subject (scary...) and wouldn't stop asking, rather gruesome questions, about it all. Rather difficult to answer a 4 year old, without being too cut and dry about it. How does one navigate such a subject? everyone was wearing for Remembrance Day, I thought I'd resort to being a bit "girly" about it all and whip up some of my own (adorned with sparkly beads, as I'm that type of chick!!!) to honour the soldiers we'd lost. I found some fabulous red felt in one of the "junk" shops, which I accidentally washed at 40 degrees (without knowing it was wool felt), but the accident, turned into a blessing as it shrunk and gave the felt a thicker more unusual feel and look. I cut out 12 petals (4 large ones, 4 medium ones and 4 small ones). Sewed them together, layer by layer, starting with the small layer first, then added the medium layer behind and finally the large petals. Then attached the broach at the back, with some super glue as well as some stitches to really hold it in place. Covered the broach with another piece of felt. Then sewed on all the little pearly beads, on the front of the flower. and some in black/brown - more suited to this POPPY event. They somehow feel rather glamorous!!! These popies are absolutely beautiful and handmade too. 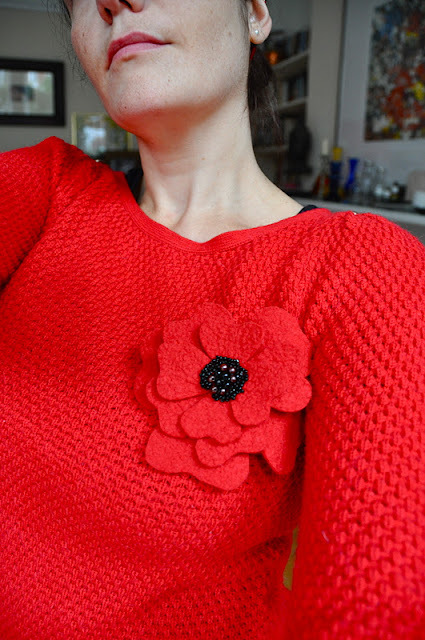 I have red felt at home and think I will make this for next year, thank you so much for inspiring the homely crafter in me. 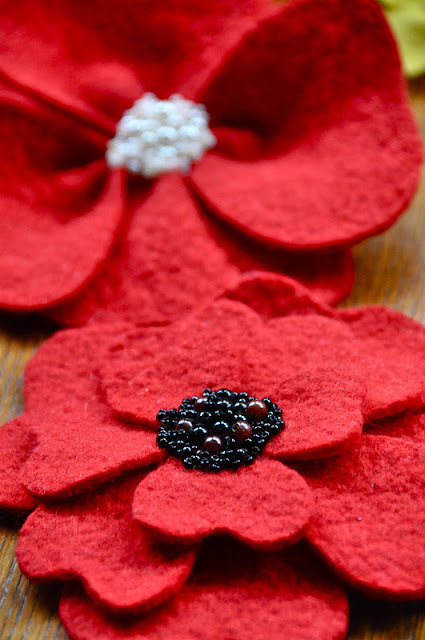 They add a touch of glamour to to poppy day.